The Court gave the Obama administration near-total victory, striking down key parts of Arizona’s immigration law. Arizona’s campaign to implement its own anti-immigration law and enforcement policy—a campaign emulated by several other states since—came to a virtual dead end today, as the United States Supreme Court ruled that immigration law is the prerogative of Congress and the Executive, and that states may not adopt laws or enforcement policies that conflict with the federal scheme. Although many people predicted after oral arguments that much of Arizona’s law would be upheld, the Court struck down three of the four provisions at issue as inconsistent with federal law. Even in regards to the fourth provision, the so-called “show me your papers” rule authorizing Arizona police to check the immigration status of persons they have stopped or arrested, the Court merely said that it was too early to tell whether it was valid or invalid. It said that a ruling on its legality would have to wait and would depend on how it is interpreted and applied. If, as seems highly likely, this provision is enforced in a way that invites racial profiling, it may well be invalidated yet. In short, the decision, written by Justice Anthony Kennedy and joined by Chief Justice John Roberts and Justices Ginsburg, Breyer and Sotomayor, was a virtually complete victory for the federal government, and a huge loss for anti-immigrant forces. In some respect, this should not have come as a huge surprise. While the politics of immigration is deeply divided, both conservative and liberal justices have long been united on one thing: immigration law is a federal matter. The immigration power is expressly assigned to Congress by the Constitution, and it obviously implicates basic questions of federal sovereignty and foreign relations. To allow each state to enforce its own immigration law would be a total disaster. Today’s ruling reinforces that principle, holding that Congress has plenary power over how to legislate on immigration, and that the Executive has authority over how to enforce immigration law (as President Obama illustrated two weeks ago in announcing that he would exercise his discretion to stop deporting certain young illegal immigrants). Two of the four provisions at issue made it a crime under Arizona law to be in the United States in violation of federal immigration law. Arizona argued that since it was only adding state penalties to conduct that federal law already made illegal, it was acting within its authority. The Court rejected that argument, holding that it is Congress’s decision how to punish violations of the immigration law, not Arizona’s. Arizona made crimes out of infractions that Congress chose to treat only as civil immigration law matters. That, the Court said, is flatly inconsistent with the federal immigration scheme. Under this part of the decision, all copycat state laws that add criminal penalties to federal immigration infractions will almost certainly be impermissible. Some civil rights and immigrants’ rights groups have expressed disappointment that the Court left standing a fourth provision. It requires Arizona officers to check the immigration status of all persons they stop or arrest for some other purpose, where they have “reasonable suspicion” that they might be here in violation of federal immigration law, and bars release of any arrested person before his status is determined. This provision, critics rightly assert, is bound to invite racial profiling in its enforcement—it seems highly likely that Arizona officers’ “reasonable suspicion” will be based on racial or ethnic appearance (even though in a state like Arizona, with a substantial Latino citizen population, that’s hardly a reasonable basis for suspicion). But contrary to some of the civil rights groups’ criticisms, the Court did not actually uphold the provision. It simply ruled that it’s too early to tell. And in so ruling, it warned that if it’s enforced in ways that many fear, it very well might be invalid. Here’s what the Court actually said about the “show me your papers” law. First, it noted that the law was challenged before it went into effect, and that on its face it includes several important limitations. The law says that showing an Arizona drivers’ license or similar identification is presumed to establish legal status. It prohibits consideration of race or ethnicity except as permitted by the Constitution and it says it must be implemented consistent with federal law. Moreover, the Court said, there is nothing inherently inconsistent with federal law for a state official who has lawfully stopped someone for some other purpose to merely check his or her status. The decision about what to do with that person would remain a federal matter. At the same time, the Court warned that “detaining individuals solely to verify their immigration status would raise constitutional concerns,” and that delaying release to determine status would “disrupt the federal framework.” But as the law was enjoined by the lower federal courts before going into effect, it had not yet been interpreted by the state courts. The state courts, the Supreme Court speculated, might interpret the provision to avoid direct conflict with federal law—such as, by holding that it requires officers only to institute checks but not to actually complete them before an arrested person is released. And it stressed that once the law goes into effect, “other preemption and constitutional challenges” could be pursued. Thus, if this provision leads to racial profiling, or to detentions that are initiated or extended for status checks, it can be challenged again—and under this opinion, very likely would be invalidated. In short, the Arizona decision was almost a complete victory for those who have been fighting the efforts of many states to use their state laws to make life miserable for immigrants. It concluded with a heartfelt reminder that we are a nation of immigrants, almost as if the Court were pleading with the country for compassion and reason in an area that has been dominated by vitriol and demagoguery. We can and should celebrate the decision for the roadblock it has erected to the state law anti-immigration movement. Comprehensive immigration reform remains essential at the federal level, but this decision means that efforts to use states to target immigrants are likely to fail. Looking for more coverage of recent Supreme Court decisions? 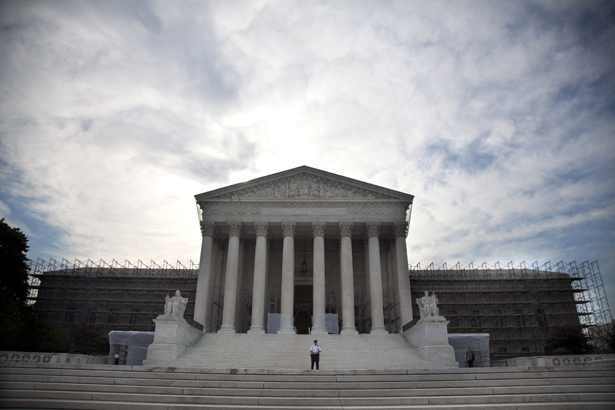 Read Liliana Segura on the Supreme Court’s ruling against life without parole for juveniles.